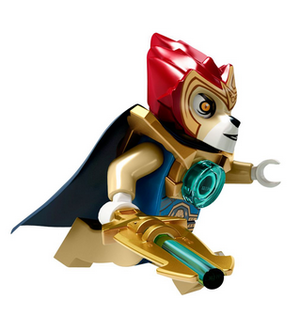 Laval is a Legends of Chima minifigure released in 2013. He is the theme's main protagonist and a member of the Lion Tribe. Laval is a feature in building, Speedorz, and Construction Figure sets. 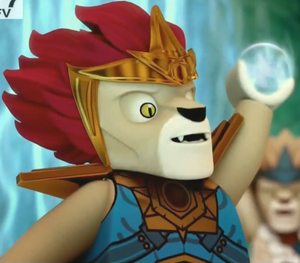 Aside from Legends of Chima: The Animated Series which chronicles his adventures, Laval also appeared in his own video game, entitled LEGO Legends of Chima: Laval's Journey, as well as a brief cameo in Legends of Chima Online. During the first year of sets, Laval donned a sleeveless, blue tunic. He wore a golden harness over his chest with a blue CHI orb in the center. Over his waist was a blue belt fastened by a buckle with a lion head. He wears a kilt on his legs which extends about halfway downwards. His skin is tan in colour, with white hands and feet which are also detailed with black claws. Laval's head uses an extension piece with a cat-like head fitted over a standard mini-figure one. The extension features an extended snout with the muzzle coloured white and nose black. An open-mouthed smirk is printed under the nose. Laval's golden, cat-eyes which are surrounded by white show through holes in the head. Around Laval's face is a crown which spikes up in the top. It separates the rest of his head from a spiky, dark red mane pointed backwards. Laval was the son of Lagravis, the nephew of Lavertus and a prince of the Lion Tribe. He is friends with other tribe members high up in the class system including Eris, Gorzan, Worriz, Skinnet, Rhogon, but above all, Cragger, who is his best friend. 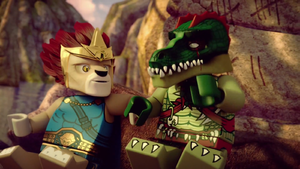 When Cragger discovered the effects of Chi, a rift formed in his and Laval's relationship, to the point where the Lion and Crocodile tribes came to battle. In the climax, Cragger's parents, Crominus and Crunket fell into the Gorge of Eternal Depth. Though they survived, they were presumed dead. As the new king of the Crocodiles, Cragger was depressed about his parents death, but did not blame the lions. However, he was hypnotized by his sister, Crooler, into declaring full-out war against the Lions. However, Laval and the other lions were unaware of this true reasons behind Cragger's actions, believing that he performed them intentionally. At Laval's coming of age ceremony where he was to place CHI in his chest for the first time, the Lion CHI Temple where the Lions made their home was attacked by the Crocodiles and their allies, the Wolves and Ravens. Laval chased after their new leader on a Speedor and dueled with him, stopping when he realized it was Cragger. After many battles won for Laval, he shows him mercy, but Cragger throws Laval into the nearby water. Laval began to drown, but was rescued by a Lion Legend Beast, animals of great power who never drank CHI and left Chima long ago. Laval rode the beast back to the battle, which the Eagles and Gorillas had now joined, on the side of the Lions. Nonetheless, the lions were losing horribly, and when Cragger comes to his senses, Crooler hypnotizes him again. The Beast roared and the fighting stopped as all present bowed down to it, except for Cragger. He plugged an orb of CHI into his chest and charged at the beast, only to be swatted away. Using the orb of CHI that Cragger dropped, Laval was able to defeat the Crocodile King and forced his troops to retreat. He still wants to help Cragger. Laval is skilled in both Speedorz tournaments and is expected to be a warrior on the battlefield, but he is immature and would rather play. Razar describes him as a "goody two-paws." Before venturing into the Outlands, Laval and the other heroes stopped by the Lion City as Lagravis reminisced about everything that had happen since the battle at The Fangs. Undeterred by his fathers words however, Laval inspired his friends and raced out of the Lion Temple. The heroes met up with Crunket at the Outlands edge where she revealed that the Crawlers had been created using the Chi Laval threw into the Gorge of Eternal Depth months prior. Laval awoke on the fifth day to find that Cragger and Worriz had left in the middle of the night and were captured by the Crawlers. Yet before they could set off to rescue them however, Lavertus presented the remaining heroes with new and upgraded weapons. To Laval he gave a pair of Chi powered grenades and his Black Valious sword. However, when Laval encouraged the exiled lion to join them, Lavertus refused and stormed off. After recovering from being thrown to the ground by a blast from the scorpions, Laval ventured inside the cave to find the Lion Legend trapped on a small rock surrounded by water, the lion's greatest weakness. Laval pulled out the last Chi orb, but the Lion Legend informed him he had to use his inner-Chi. Using Cragger's advise about water from a few days prior, Laval jumped into the water and managed to swim to the Lion Legend. Once there, he managed to convince the Lion Legend to swim as well and the two returned to the main cave where the heroes were engaged in a fierce battle with the remaining Crawlers. The heroes managed to escape the collapsing cave alive, but only due to Lavertus arriving and sacrificing himself to save them. At the cave's entrance Laval confronted Scorm and gave him their final orb of Chi before the entrance fully collapsed. Following the defeat of the Crawlers, Chima enjoyed a short era of peace. During that time, Laval was given his uncle's journal by Rinona, which he spent hours reading. He returned to the Outlands with the other Chima heroes several times in an effort to turn Lavertus's home into a museum to honor the fallen Lion. Laval jousts Cragger in the final tournament, but looses due to the crocodile using a longer stick. After the event, Laval sulks outside the Lion Temple, but notices a bright light coming from Sprial Mountain. Curious, he investigates, though encounters several Crocodile Guards along the way. He eventually reaches the top of the mountain to find that Cragger has created a machine using orbs of Chi to break up the Golden Chi. The two battle, but Cragger manages to escape and the machine explodes, sending Chi droplets everywhere. Laval returns to the Lion City where he informs Lagravis of what has happened. Before they can deal with Cragger however, Longtooth reports that the eagle spire is under attack and the lion prince is sent by his father to determine the tribe responsible. The Lion Guards reopen the path to the eagle grasslands and Laval arrives just as Eris is taken captive by the wolves and ushered up into the Spire. Laval pursues, freeing several eagle scholars along the way. 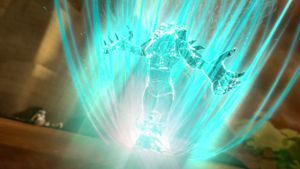 Eventually he encounters Wiz, whom he defeats and frees Eris, who reports that the wolves have taken the ruling council captive. They make their way through the eagle town and the library where Worriz crashes through on an eagle jet. The two give chase to the top of the spire where they find Ewald guarded by Rukus and Runk. They manage to defeat Worriz, who leaves with the eagle's sacred chest plate. Laval frees Ewald who thanks him and orders him to return to the Lion City to report what has happened to Lagravis. Laval and Eris do so and the king of the lions orders them to the gorilla forest which he believes will be attacked next. Lagravis's suspicions prove correct as the entire tribe of gorillas has been hypnotized by the raven's flowers while they ransack the gorillas homes. They meet up with Gorzan who shows them the way to the Gorilla's groovy glove, only to find Razar there with a captured Bladvic. The raven hijacks a gorilla striker, but the trio manages to defeat him, but are unable to reclaim the glove before Razar escapes. The three venture back to the lion city to inform Lagravis only to find the king of the lions fending off an attack by Cragger who is wearing the sacred chest plate and the groovy glove. Cragger grabs Laval and threatens to hurt him, but Lagravis agrees to take him to the final piece of the triple chi armour. Laval, Eris, and Gorzan run after them, but are stopped by the lion guards protecting the way to the rhino quarry who have been order by Lagravis to forbid them to follow. They then come across Worriz, who offers to help them as Cragger betrayed him and with their help, they manage to sneak around the guards. At the rhino quarry, they find Rogon who had shown Cragger the way to the pretty picture caves in exchange for a disco player. Laval promises the rhino a rock party if he can help them, who eagerly agrees. At the pretty picture caves, Eris deciphers the legend of the triple Chi armour and they realize that Cragger now has all three parts. Deciding to confront him directly, Laval and the others head into the crocodile swamp and break into Cragger's fortress where they battle him in the throne room. Laval manages to defeat the crocodile and cure to the croc of his sister's persuader plant. Cragger then shows them the way to the Croc Command Ship where Crooler has taken the triple chi armour and Lagravis. The heroes disable the boat and free Lagravis, who reveals that the armour must be taken to where the balance was first lost; at the top of Spiral Mountain. Suddenly. Worriz grabs the armour and escapes with it, intending to use it himself. Wasting no time, Laval, Eris, Gorzan, Rogon, and Cragger race towards Spiral Mountain as the sun sets on the night of a full moon. They storm the wolf camp and make it up Spiral Mountain where they defeat Worriz and Lagravis uses the triple Chi armour to restore the land. Laval is ambushed by crocodiles in the Forest of Falling Leaves and the player's first mission is to rescue him. Laval instructs the player in the basics of the game including fighting, moving, and Chi-ing up. Once the crocs have been defeated, Laval tells the player to build an outpost using the land and sends Lothar to train the player while he returned to the Lion City. The September–October issue of LEGO Club Magazine included a Laval sticker. In his every appearance, armour is included for him. "The Biggest Race of All"
"The Eagle and the Bear"
"This May Sting a Bit"
"Attack of the Ice Clan"
"Tale Of The Tribe Stone"
"The Cloud and the Shadow"
"Whatever Happened to the WindShadow?" Laval Laval is the headstrong prince of the Lion Tribe who still has a lot to learn about what it means to be a leader. Duty doesn’t always take priority over having a good time. But what’s the harm in pulling a little prank every so often? Like a lot of kids, he has an insatiable curiosity and a relentless flair for challenging the rules. This can be a problem since the Lions are all about following and enforcing rules. Can Laval figure this out and become the great warrior and leader his tribe expects of him? Laval The prince of the Lion tribe, Laval was once very headstrong and more interested in having a good time than anything else. But the battles over CHI have helped him to grow up a little bit. While he still loves nothing more than a new adventure or a chance to have fun, he also understands more about the duties and responsibilities of a prince. He showed that by his willingness to put the past aside and ally with Cragger against a common threat. 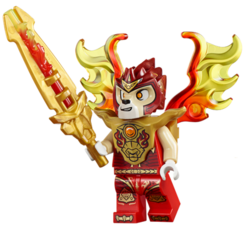 As the leader of a new, united team of heroes, the fate of Chima rests on his shoulders. This page was last edited on 12 January 2016, at 23:17.